Project Perfect Mod :: View topic - Voxel Of The Year 2006: Cast your vote! What is the best voxel of 2006? Posted: Sun Dec 31, 2006 2:14 pm Post subject: Voxel Of The Year 2006: Cast your vote! Subject description: 6 candidates, but only one winner! You choose! 1) Chrono Hole Tank, by Dupl3xxx! In only one spotlight, Dupl3xxx has made an awesome Chrono Prison from scratch. For someone who wasn't a well known voxeller, this was worth the shot! 2) IVI MRP-T13 'Sting' Stealth Assault Tank, by IVI AFV-factory! IVI's first package was full of great voxels. Sting had the most original design of them and it's also a great piece of art. 3) The First Decade Concept Tank, by Muldrake! Muldrake's TFD Concept Tank is another great piece of art that follows the poster that comes with TFD in with great accuracy. 4) Alternate Prism Tank, by •Tony•! 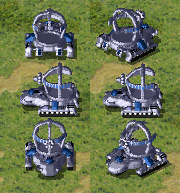 Tony's Prism Tank is also brillant, very similar to the original concept of the unit. Tony has prooven to be a great voxeller with his 3 submissions and he was second in the Freedom Studios Voxel Competition, only behind the eternal Voxel God MadHQ. 5) IVI SPAFV-34 'Stegodon' Land Destroyer, by IVI AFV-factory! Stegodon is a brillant voxel featured in the second delivery from IVI AFV-Factory. I'm sure a group of Stegodons invading your base would scare you, wouldn't it? Anyway, that package also had some other brillant voxels such as the Quan Tou, but Stegodon was really the best, in my opinion. 6) Concept Mammoth Tank, by Muldrake! I've seen a lot of mammoth tanks rather inspired in the Mammoth 27 from Tiberian Wars or on other games being posted in this year, but none of them beats this one, from Muldrake, made from the leaked C&C3 concept art in 2004. An interesting curiosity is that the mammoth tank was nearly invisible in that concept art, but Muldrake still managed to reproduce it in a genious way! So, that's it! Cast your votes and let's see who is the Best Voxel of 2006! Well, Banshee, I'm rather dissapointed. 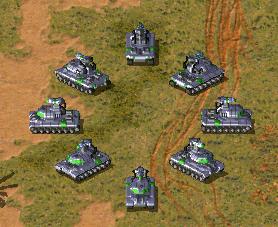 You left a lot of vxls out, such as all of Rly_BiG_Tanks work. And Stingerr's work. I think you should add them to the list too, but that's just me. i think those are for use in a mod, whereas these are not. my vote is for muldrakes mammoth, it just fits TS the most. I cannot post 100 voxels here, Gosho. These ones are the ones who looked most awesome for me. Stingerr's and RLY_Big_Tank's work was also awesome, but these voxels were looking better. I like the Stegodon a lot, I love it's design and very awesome detail on the turret and the base of the vehicle, Stegodon FTW!! 2 Entrys for IVI and Muldrake? I think thats a little unfair, take one of IVIs and one of Muldrake's off, and put on Stingerr's Apoc and one of Rly Bigs..and ingame shots should be used for these pictures. Voxel Veiwer shots are unfair. My purpose here is not to find the best voxeller. I'm looking for the best voxel. So, if a person submit two top notch voxels like IVI, I cannot ignore his work. Both Sting and Stegodon are pure awesome stuff. Muldrake's entries are awesome as well. i like muldrakes concept mammy best. but maybe i woulda been persuaded otherwise if i woulda seen ingame pics of IVIs stuff. BTW if theres a best mod of the year and a best voxel of the year will there be a best shp of the year and a best map of the year? Well I do quite like IVI's Stegodon but Muldrakes Concpet Mammy has one it for me! My name is Shadow... I am Lord of the Shadows! NOD rules!!!! The only voxel that I have posted on the net gets in top 6!?!?! And when I see the other voxels, I cann't belive it! Tony ftw! I always love what he has to show, the texture and everything, so I voted for him. AND... he also got me to start making voxels. Well I can't very well vote..But I love Muldrakes Concept Mammy . I'm going for Muldrake's mammoth tank FTW. Only the voxels that were submitted to PPM were listed. So, no, we did not consider any submissions to FS Voxel Competition. I Voted for the Chrono-hole tank. Simply because It looks good and has a good concept. If it was not there, i would definatly of gone for Muldrakes mammoth tank. But they are all very good voxels, nice work guys. It seems Muldrake is going for the win! Go Muldrake! Muldrake's Concept Tank has already won. This poll was suposed to expire in the end of january and Muldrake was already winning, but I'll still consider votes until the end of february. Well I would have voted for either of Muldrakes as the best anyway, they are simply brilliant. I'm sorry, but I am kind of dissapointed. Nothing really outstanding to me. But hey, what do I know.